Eos the goddess of Dawn was the daughter of two Titans, Hyperion and Theia. She was the sister of Helios (the Sun) and of Selene (the Moon). The goddess of Dawn once had an affair with Ares, that's why Aphrodite (the official lover) became very jealous and punished Eos to be eternally in love. That's why the Greek goddess Eos had many love affairs, especially with mortals. Each morning, she would leave her island on the shores of Okeanos, then she would take her golden chariot and rise up to the Sky, to scatter the shadows of the night. Then she would open the gate for the Sun's chariot. Homer often calls Eos the goddess of Dawn, in the Iliad and in the Odyssey, the "rosy fingered". Some writers said she accompanied Helios all day long, not just in the morning, and that's why she was sometimes identified with Hemera, the personification of day. When she fell in love with someone, she would just kidnap the guy and that's that! She kidnapped the giant Orion (who was a genuine Mr. Wrong) and took him to the island of Delos. When she fell in love with a Trojan, named Tithonus, she kidnapped him and took him to Ethiopia. The had two sons, Memnon and Emathion. They loved each other so much, that Eos asked Zeus to grant Tithonus eternal life. That's what Zeus did - but, when asking something, you should choose your words carefully! Eos the goddess of Dawn forgot to also ask for youth, so Tithonus grew older and older. Eos locked him in her palace, because she didn't want to see him any more. The poor Tithonus shrank until he became a grasshoper. In the Trojan war, her son Memnon fought against Achilles. Their mothers, Eos the goddess of dawn and Thetis, ran to Zeus, each of them asking mercy for her son. Zeus put their "fates" on the scales. As Memnon's "fate" was heavier, he was the one who had to die. Eos begged Zeus to give her son immortality, then she took him and transported him to Ethiopia, where he became king. The tears she cried for Memnon, when he was dead, turned into the dew we see each morning on the fields. While being married to Tithonus, she fell in love with Cephalus, who was married to Procris. Eos tried to convince him to flee with her, but he refused, because he was in love with his wife. Eos the goddess of Dawn told him there was no problem to cheat on his wife, because she cheats on him too. In order to prove this, she gave Cephalus a different look. He went to his wife (who didn't recongnize him, of course) and managed to seduce her. Procris ran away, ashamed of herself, and Eos... Guess what she did? Why, she kidnapped him, of course! and took him to Syria, where they had a son, Phaeton. But Cephalus left her very soon and returned to his wife. She had a thing for mortals, but she could appreciate a god, too. With Astraeus she had several children, the Winds (Zephyrus, Boreas, Notos), Eosphoros and the Stars. 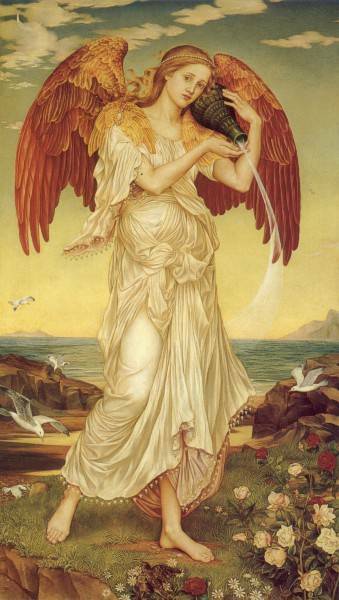 For more pictures of Eos the goddess of dawn, but with her Roman name, Aurora, click here.